The ACCG, under new leadership, is still championing and assisting local governments. 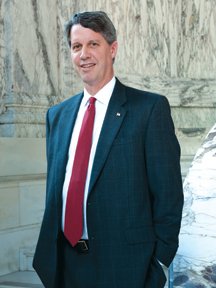 Last year, after 23 years with the Association County Commissioners of Georgia, or ACCG, Ross King became the third executive director in the organization’s history, succeeding Jerry Griffin. ACCG has been around since 1914, although it didn’t have an executive director for the first half-century or so of its existence. It represents the interests of Georgia’s 159 counties, a tough task since that number includes rural, urban and suburban jurisdictions. With the economy tight and tax revenues shrinking even as counties are being called upon to do more, it’s a tough time for local governments. King talked to Georgia Trend’s Susan Percy about the organization, how it is adapting to new demands and what it is doing to help counties through hard times. Following is an edited version of the interview. GT: What’s the main job of your organization? King: We have been legislative advocates for counties at the statehouse and have served as the voice of Georgia counties within the state legislature and state government. That is foundational. This association was founded on behalf of county governments in Georgia who have a very critical role in health, safety and welfare. GT: What have you been working on since you became executive director? King: I took a look at opportunities to move into more depth in relevance and membership service. We put in force a new structure with four areas: civic or community engagement; education and leadership development; public policy and legislative advocacy; and membership services. We felt it incumbent upon us as an organization to spend time bolstering the civic engagement area. GT: Do citizens in general understand what their local governments do for them? King: As we go through the day we very willingly will pay for a retail service at a restaurant or store. We recognize a transaction that is to take place. Yet our consciousness does not acknowledge the road we are driving on, the transportation safety system we have in force, the fire hydrants, the water towers, the court system, trained technicians for emergency management, fire fighters, sheriffs’ deputies, the public health system, the library system. That’s just a small cross section of items available to us, a great deal of it without the daily transaction taking place. GT: But people take all that for granted? King: When our tax bill is received there is frustration, it appears, in making that payment to the county, the city or the school board. It’s very important for citizens to raise questions about where their tax dollars are going. But I would suggest that the value that one receives, in terms of what they are paying from a tax and fee standpoint, is very high. GT: Why is it so hard to communicate that value? King: People want to focus on family, on personal finance, on property. We need to be sensitized as counties to the fact that constituents are seeking assistance, but not on a daily basis. The court system is available to you when needed. The library system and healthcare system are available when needed. Should we abdicate that? Who steps in at that point to provide services? GT: Do you worry about the current wave of anti-government sentiment? King: It just reinforces the importance for us to talk truthfully about county government operations in a manner the constituents can embrace. It’s very healthy for constituents to ask the types of questions being asked today – questions about federal government operations, state government operations. I’m most interested in finding out on behalf of taxpayers where do they want their government to be involved and engaged. GT: It seems there are increasing demands being made on county governments. King: My concern, as we reorganize the federal government and reorganize state government, is what will fall to the locals to provide in terms of services and operations? Mental health is a classic example – there are shifts taking place with the state’s management of mental health. These individuals [the mentally ill] are at our doorstep, literally. A county finds itself in a position where we have to address the mental health program needs, as state government has made cost shortages occur or closed program areas or significantly reduced staff. GT: So sometimes local governments are forced to take responsibility? King: Some of these issues will have a federal and/or state court directive attached. For instance, indigent defense. We have got to provide, according to court directives, legal defense on behalf of those incarcerated in county facilities. These difficult public policy issues land directly at our feet. We have to come to a resolution at the local level. It’s critically important to have discussions on a regional level and to some extent, through the association, on a statewide basis. GT: Then how do you move from discussion to resolution? King: When I first joined the association back in the late ’80s, one of the things Jerry asked me to work on was development of a policy process. We have six separate policy committees for developing our platform, so members decide which committees they prefer to serve on. We have numerous discussions with rural, suburban and urban counties to come to a conclusion. The platform itself is formally adopted by the membership. Some of these matters in the platform will end up in legislation that we work on with house and senate members, others will guide us toward dialogue with agencies on their regulatory systems, maybe amendments or adjustments to those systems. GT: What are counties concerned about, and what are you monitoring on their behalf? King: We’re looking closely at the work conducted by the tax commission, and we have for many years been focusing on water resource management and transportation. GT: Isn’t water a tough issue to deal with on a statewide basis? King: It’s important for ACCG to work very hard to focus on the state of Georgia – we are one state – and do anything we can do to push away from fractionizing topical areas. There’s a great deal of emotion that’s been brought forth on the water resource area, and it’s important for us to understand where that emotion is generated and have some long-term vision as an organization about water resource management. GT: How do you do that? King: First you’ve got to take a look at the core facts – where are the river basins, where are the watersheds. That’s not debatable. Take a look at who’s in the business of providing water – public and private. Again, not debatable. Take a look at growth trends, what is projected to occur in the future, then begin to drill down very specifically. There have been discussions about water conservation, but have we gone as far as we need to go in terms of taking a look at water conservation technologies? Look at heavy water users on a county-by-county basis, make sure public policy centers understand who is utilizing the water. … Is there technology available to alter that water use? GT: But there’s still all that emotion surrounding water and the false, but persistent, image of “greedy Atlanta” with a big straw. King: There’s a lot of emotion now on the topic of interbasin transfers. You have to understand what the impact is on restricting transfers of water from one basin to the next. We have worked very hard to put before our membership base … here are the facts in regard to where the basins fall, and here are the counties fractured by being in multiple basins – in excess of 100 counties. So before you reach a specific public policy decision and let emotion drive you toward that decision, understand the cause and effect that will occur by the adoption of a particular law or regulation. GT: Georgia has 159 counties. Is this too many, especially in light of the tough economy? It’s important for counties today to be as responsive as they can be – in a strong home-rule state – to constituents and constituent services. If that means regional cooperative ventures on service delivery for better cost and better provision of services, we’re absolutely in favor of that and have helped foster some regional discussions on topics like enhanced 911 systems, potential discussions about regional jails. Regional healthcare must be discussed. We’re going to have to take a very strong look, now that the trauma care constitutional amendment has been defeated, at regions of the state that don’t have the trauma care system in force. There’s no question this association is going to be talking about consolidation of services and regional strength. GT: Is the idea of collaboration or even consolidation appealing to members? King: The economic transformation that has occurred since 2008 demands for there to be a collaborative air in force. Our board and staff take the responsibility of collaboration very seriously and are working hard on all fronts to ensure that we have the dialog to help us prepare. If that leads eventually to consolidation of counties, then that will come through informed discussion-making and be driven by local discussion. I would sense that in order for it to occur there would have to be incentives provided [by the state]. GT: You mentioned the failed trauma care amendment, and last year Macon voters turned down a SPLOST. Should we read anything into this? Are people simply less trusting of their governments? King: Having public dialogue and discussion about dollars and where those dollars go is very healthy for our country and especially for our state at the local level. It’s important for constituents to be told that if this fee is not collected, here is the impact that can be felt. I think SPLOST is one of finest financing tools available to local governments in recent history. You tell voters specifically what the tax is going to be dedicated for, and they have the capacity to vote for or against that. I think the large preponderance of SPLOST referenda on the books today are still successful. The margins may not be as broad in the past. GT: Let’s talk about declining property tax revenues. What is your organization’s role in helping counties figure out how to do more with less? King: We have to take another look at the dynamics brought by foreclosures, by significant reassessments, to assure that counties have the capacity to communicate with one another to take a look at innovative services and programs being developed as dollars get tight. As we are striving toward economic recovery, reassessment and foreclosure impact adds a longer tail for counties. We are going to be a couple of years at a minimum at that true bottom. It’s going to be difficult to provide the services and trained staff that counties are required to have, that the public wants us to have, and to cover our costs of operation. GT: Priorities can change when funds are tight. King: There was a significant pushback in the ’90s regarding “three strikes and you’re out” from a public safety perspective. We wanted a comfort level that we moved habitual criminals off the streets. [But] we’re required to provide certain basic needs for those who are inmates in terms of healthcare, their meals, where they reside. There are significant pressures on state prisons, and as a result there is a backlog of state prisoners in county facilities as well as our own inmates to take care of. The public doesn’t want us to open the jailhouse door and let those individuals go free, but there is a financial impact. So we’re taking a look at innovations. Do we put together a stronger probation program? Do we take a look at those ankle bracelets and other probation systems and amplify that? GT: How do counties get through such a tough time? King: We’ve got to be more accountable on the expenditure side, then address the revenue needs. We are going to have to take a look at what revenue can be generated and how we can conduct our business while balancing the budget. That’s going to put more pressure on some rural counties, but the urban counties are not escaping. No region of the state has the capacity to look away from the revenue and expenditure sides of the ledger.